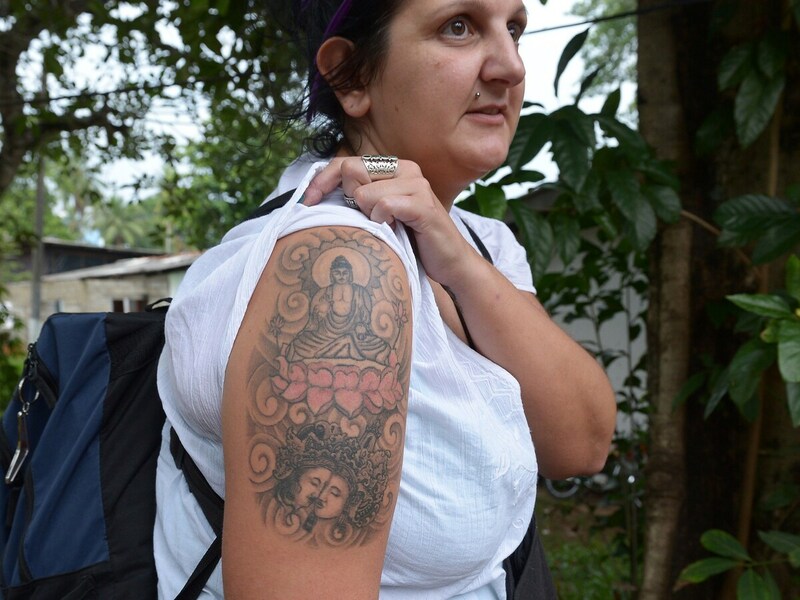 Tattoo Of Buddha Gets British Tourist Thrown Out Of Sri Lanka : The Two-Way A 37-year-old British woman was detained in the island nation after a taxi driver noticed her Buddha tattoo, which is viewed as a religious affront to the country's dominant religion. British tourist Naomi Coleman displays the tattoo that has gotten her deported from Sri Lanka. The island nation of Sri Lanka has ordered the deportation of a British tourist for arriving in the country sporting a Buddha tattooed on her arm. Authorities say the ink shows disrespect for religious feelings in the majority-Buddhist nation. Naomi Coleman, 37, says she got through immigration at the airport near the capital, Colombo, without incident, despite wearing a short-sleeved shirt that exposed the tattoo of a Buddha seated on a bed of lotus flowers. "It was just when I was taking my suitcases out, one of the taxi men at the stand stopped me and said, 'Oh, this is a big problem in Sri Lanka, you've got a Buddha tattoo,' " Coleman, a mental health nurse, told the BBC. The news agency says Coleman "[told] police in a statement that she practised Buddhism and had attended meditation retreats and workshops in Thailand, India, Cambodia and Nepal. "Ms Coleman said she had to spend Monday night in prison in Negombo, near the airport, after appearing in court.
" 'I went on the stand, they called me. But they didn't let me speak or plead my case. They were just talking among themselves,' she said.
" 'Then they said, "You're being deported.' I said, 'I've got another trip booked to the Maldives, can I just go there, I'll leave Sri Lanka then.' They said, 'No, you'll have to be deported back to your home country and you'll need to go to prison for the night.' "
Coleman says she's been told she may have to wait several days to leave Sri Lanka while authorities conduct extensive security checks on her "like I'm a criminal or something," she said. The Telegraph says the woman's case is similar to one a year ago in which another British tourist was banned from entering Sri Lanka for precisely the same offense — a Buddha tattoo on his arm. "In August 2012, three French tourists were sentenced to six months in jail, which was suspended for five years, for kissing a Buddha statue in what the authorities considered was a sign of disrespect. "Sri Lanka prevented American rap star Akon from visiting in 2010 over one of his music videos, which featured scantily clad women dancing in front of a Buddha statue." About 70 percent of Sri Lanka's 20 million people are Theravada Buddhists, but the country also has significant Hindu, Muslim and Christian minorities.